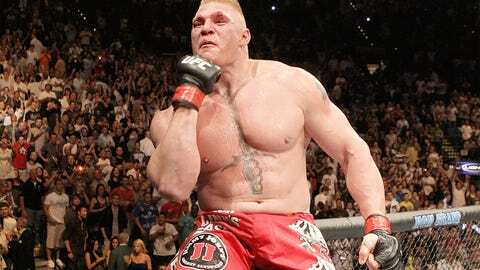 Brock Lesnar and Nick Diaz back in 2014? No thanks. The UFC should stay focused on developing its current roster of fighters. Brock Lesnar and Nick Diaz are a combined 0-4 in their last four trips into the UFC Octagon. The last time either of them won a fight was UFC 137, when Diaz battered a doughy, uninspired version of B.J. Penn on a night where he was originally scheduled to challenge for the welterweight title. 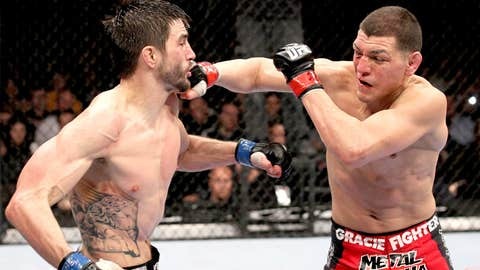 That was ages ago – October 29, 2011 to be exact – and yet Diaz’s most recent win under the UFC banner still came a year and change more recently than Lesnar’s last successful sojourn into the cage, which came in his comeback classic against Shane Carwin. Setbacks still have to set you back in the title chase, no matter how big your name is. And yet here we are — on the verge of wrapping up the best year in UFC history with an incredible fight card, and one of the major talking points of the weekend is a potential return to action for Lesnar, who called it quits after his loss to Alistair Overeem at UFC 141 to spend more time with his family and return to the world of professional wrestling. Diaz, for his part, is never far from the conversation either. Without fail, every post-fight press conference or media scrum includes someone asking UFC President Dana White about the former Strikeforce welterweight champion, who took his ball and went home after his UFC 158 loss to Georges St-Pierre. Despite not having fought since 2011 and having lost consecutive decisions – not to mention having missed nine months in between due to a suspension — the UFC was ready to hand Diaz a rematch with Carlos Condit, a bout that would have undoubtedly established the first title challenger for whichever of Johny Hendricks or Robbie Lawler emerges as the new welterweight champion at UFC 171 early next year. Big personalities often mean big problems. Hopefully both remain retired, because if they don’t, the UFC is once again going to focus on the immediate benefits of two big-name returns rather than their recent results when it comes to getting Lesnar and Diaz back in the mix. Based on results alone, neither should be close to contention. As much as Diaz lost a pair of championship contests before heading back to Stockton to run triathlons and partake in whatever other recreational activities he enjoys, setbacks still have to set you back in the title chase, no matter how big your name is. In the time that Diaz has been retired, other fighters have worked their way up the rankings and earned their chance to compete against the best the division has to offer. If he opts to bring his hiatus to a halt, the talented Cesar Gracie student should have to do the same. And Lesnar should have an even lengthier road back to contention should the rumors be true, given his two-year absence and being four years removed from having his hand raised inside the cage, but that likely wouldn’t be the case for him either. The coming year should be about continuing to build up fighters like Jones, Ronda Rousey, and Weidman. Because of his huge appeal, the former heavyweight champion — who has bookended his time in the UFC with stints in the WWE — will be right back atop the marquee, promoted and pushed ahead of athletes that have put in their time and are more deserving of the opportunity. What’s troubling is that as we head into 2014, the UFC apparently didn’t learn anything from this past year. In the first half of 2013, Diaz and Chael Sonnen fought for the welterweight and light heavyweight titles, respectively. In both cases, the undeserving challengers were turned back in one-sided contests that were surrounded by a great deal of hype, but failed to deliver much substance once it was time to get down to brass tacks. The second half of 2013, however, saw a pair of fighters that had worked their way up the rankings and into position to challenge for titles — Johny Hendricks and Alexander Gustafsson – step into the Octagon with significantly less fanfare than the men that preceded them, only to combine with the reigning champions to deliver two of the best fights of the year. Hell, tons of people groaned when the UFC was left with no choice but to pair Anderson Silva with Chris Weidman at UFC 162, citing the unbeaten New York native’s lack of name value as the sole reason he shouldn’t have been sharing the cage with the man considered by many to be the greatest fighter in the history of the sport. Nick Diaz has lost his last two fights in the Octagon. One minute and 18 seconds into the second round, Weidman became the first man to defeat Silva in the Octagon, and is now the reigning and defending champion as the two square off for a second time this weekend at UFC 168. He — like Gustafsson and Hendricks — may not have carried as big a name as some of the other middleweight options, but showed that his talent was superior to his advanced billing, and that is something the UFC needs to focus on going forward. The coming year should be about continuing to build up fighters like Jones, Ronda Rousey, and Weidman, while investing more energy and promotional muscle to shining a light on emerging potential stars like Hendricks, Anthony Pettis, and the legion of talented fighters plying their trade in relative anonymity south of the lightweight division. Lesnar and Diaz are a pair of retired fighters that have been unsuccessful in each of their last two trips into the Octagon. Until those facts change, the UFC needs to keep the spotlight on the athletes that are actually excelling inside the cage, and not those rumored to be making a return.